I’ve been thinking lately about the nature of our lives and our experience when things are challenging, or perhaps less euphemistically, hard, difficult, awful. What do we do and where do we go when we’re in the midst of struggle? We all love a great Triumph Over Adversity story. It’s a universal tale and conjures up the archetypal hero/heroine who ends up victorious, against great odds. The thing is, those stories are almost always told from a historical perspective. They are told when the struggle is over. We know the ending – the hero emerges victorious on the other side of that dark curtain of struggle. Even if we’re only to chapter 3 and things are grim indeed for our hero, the existence of the remaining chapters reassures us that more is yet to come (probably more pain and misery, but ultimately we will receive our emotional payoff and the hero will prevail). But what about the ‘during’ times? What if you are in the struggle, right now? You don’t know the ending yet, and even if your (non-denominational, non-sectarian) faith is solid, you still are most definitely not at the end. Personally, I often feel that my “during the struggle” times are not for public consumption. They are too raw, too unformed and I suspect too intense and confronting for other people to be shared. I feel they are unacceptable somehow, and almost certainly unattractive. I also suspect my ability to share them in an acceptable fashion is impaired — I’m too busy dealing with the struggle (or lying on the ground by the side of the road, as it were) to compose some appropriate way of summarising where I’m at and how I’m feeling. It’ll come out all wrong. 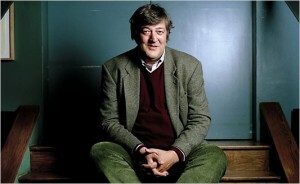 One of my heroes in this particular arena is Stephen Fry, the English actor, writer and media personality. I saw him interviewed recently and he was commenting how only that morning, he’d be dealing with feelings of not so much depression, but flatness, of not feeling on top of the world. I so admired his openness about this, his willingness to share honestly rather than yield to the temptation to mask, distract from or flat out lie about what was going on for him. As a child, my mother read ‘The Pilgrims Progress’ out loud to me and my brothers over several weeks. It is a story of seemingly never-ending adversities besetting the archetypal seeker and traveller, Christian, who suffers terribly but yet goes on. This story affected me deeply even though I was very young when I heard it. I so empathised, as perhaps was intended, with the pilgrim, I felt his every loss, setback and injury. The pilgrim’s story of horrendous and seemingly unending struggle is so deep in my psyche, I’m not sure a jackhammer could dislodge it. And it is perhaps my default image/storyline when I ponder “struggle” of any type. Struggle is dark and deep and mysterious and painful. Oh yes, very very painful. 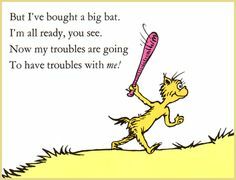 In contrast, the hero of ‘I Had Trouble In Getting to Solla Sollew’ by Dr Seuss, has a much more upbeat approach to struggle. Another story from my childhood that had an impact and stays with me to this day. And when you consider it, those two stories have pretty much the same storyline. Seriously. But not the same pictures. Ah, I always did want to stand by the banks of the beautiful river Wahoo (where they never have troubles. At least, very few. See – all of life’s mysteries can be captured by either the wisdom of Dr Seuss or in the lyrics of Country & Western songs). Definitely time for some fresh input into managing the struggle. Is this the way to deal with troubles? What can you do during the during? So what do you do During The Struggle times? I believe it’s very personal, but here are some potentially unorthodox ideas from me, in no particular order. Don’t make any major decisions. Those decisions require the full bonfire of light that emanates from your inner wisdom and soul. And During The Struggle, that light is still there, but perhaps is burning at a lower ebb. Now is not the time to make major decisions and changes in relationships, geography, work life, pet status, clothing style. Save those biggies for when your light is burning brighter and bigger. It will be again sometime soon. Don’t make it worse. By this I mean don’t develop any other habits that could turn into problems, like drinking too much, eating too much, or becoming addicted to really bad reality television shows. The fringes are fascinating, perhaps tempting, but don’t get too close to the edge just now. Be aware that others may not be able to immediately jump into the stream of your Struggle and share it with you. This doesn’t mean they don’t love you, but it may be equally true that they are dealing with their own Struggle or perhaps just with their own lives. Know that even the worst times pass. It may get worse before then, who knows, or it may stay like this for a little bit. But eventually, this situation will change. Even if you do nothing to make it change, it’ll change on its own. Don’t drop anchor. Sure, notice what’s happening around you and within you, but don’t settle in and start building a cathedral to your Struggle. Cathedrals take decades to erect and you won’t be here that long. Acknowledge that what you’re experiencing is real for you. It is not a figment of your imagination or a hallucination. You can’t simply wish it away any more than you can wish a thunderstorm away. It’s real, yes, but it’s also fleeting. Do what you need to do and drop the rest. See to the essentials (food, shelter, clothing, children being dropped off at ballet. Oh yes, and possibly even picked up from ballet). But let the big projects wait. You’re not in a good state to work on them anyway and you’ll get a better quality result over a shorter time period if you leave them incubate until you are on the other side of this Struggle. Veg out. Lounge around. Do not much. Read for pure pleasure. Watch TV marathons. Eat potato chips for lunch and cereal for dinner. Nap at 10am. And luxuriate in these abnormalities – they aren’t the status quo, they’re a vacation. Surrender, let go, breathe out, lie down, give it a rest. I don’t know why The Struggle comes and personally I can’t wait for it to be over when I’m in the middle of it. But I do know when it comes, I can recognise it. And if I take on the philosophy that I don’t know everything, I can’t see the end from where I am, and perhaps there is some purpose to The Struggle that is yet to be revealed, I can breathe into it a little easier. I can be kinder. To myself, and to others.